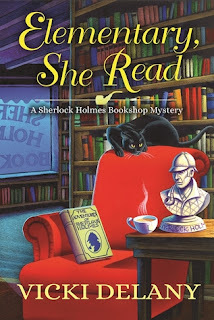 Elementary, She Read is the first book in a new series from the extremely prolific Canadian crime author, Vicki Delany. As I am a fan of her Constable Molly Smith series, I was delighted to have a chance to read this new effort. Gemma Doyle is the part-owner of the Sherlock Holmes Bookshop and Emporium in West London, MA on Cape Cod. Oddly enough, Gemma is not a particular fan of the Sherlock canon. It's the other part-owner, her great-uncle, who is the true fan. But when Gemma's marriage fell apart and her great-uncle offered her the opportunity, she jumped at the chance to leave her native England and make a new start on Cape Cod. Five years in, she has made a success of the shop and expanded into the next door space with Mrs. Hudson's Tea Room. Her best friend, Jayne, is the baker and owner of Mrs. Hudson's, along with Gemma. When a large tour group arrives Gemma and Jayne are welcoming and expecting brisk business. In the tumult of shoppers, Gemma notices a woman who is clearly not with the group. She seems distraught and furtive, not behaving normally. Gemma is a person who notices everything going on around her but she loses sight of the woman. In the clean-up after the group leaves, Gemma finds a what appears to be a bound and cellophane wrapped magazine copy of A Study in Scarlet stuffed into one of the shelves. If this is an original copy, signed by Arthur Conan Doyle himself, it could be worth hundreds of thousands of dollars. Gemma thinks that the odd woman could have left it and sets out to find her. The problem is that when she finds her in a low-rent hotel, she is dead. Gemma is less than pleased to find that an old flame, Ryan Ashburton, is leading the investigation and that she is the chief suspect. Word gets out about the magazine and Gemma is quickly inundated with book collectors, greedy relatives and sensation seekers in general. Gemma and Jayne must spring into action to clear her of suspicion. Gemma is a mixture of recklessness and an ability to reason in a very "Sherlockian" way. She can be an uncomfortable person to be around, I think, as she seems cold and dispassionate at times. But Jayne, her "Dr. Watson" and she are a formidable investigative team. I enjoyed Elementary, She Read and am looking forward to the next in the series. I hope that we actually get to meet Gemma's globe-trotting Uncle Arthur in the next book! Thanks to Netgalley and Crooked Lane Books for an advance digital copy. The opinions above are my own.